Though he was not nearly as well known or perhaps as “developed” as a head coach as he would later be at Iowa, the Cougars’ new head man had already made his mark in college football as a great player. Forest Evashevski had always been precocious and adept at everything he attempted. After serving as Michigan’s captain and the blocking back for Heisman winner Tom Harmon during a glorious Michigan run from 1938 through ’40, “Evy” turned to coaching and put his time in as an assistant at Syracuse and Michigan State as well as serving in the military teaching hand-to-hand combat while coaching and playing for the Iowa Pre-Flight squad. 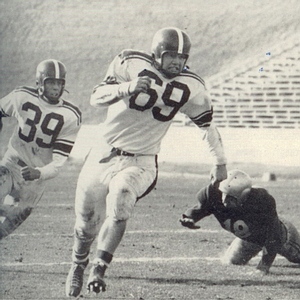 Revamping the WSU uniforms with the introduction of the Riddell plastic helmet for all members of the team, a crimson shell with a white one-inch center stripe, he also retooled the T Formation Offense with his version of the Wing-T and the Cougars broke into the win column with a 4-3-2 mark for the 1950 season. Despite the loss of leading rushers Don Paul and Marv Cross as well as outstanding end Fran Polsfoot, Evy, always confident, expected more with QB Bob Gambold, a future Cougars assistant coach, on the field. Two year starter Lavern Torgenson anchored the line before heading to a seven year NFL career with the Lions and Redskins where he also served as an assistant coach. HB Byron “Bye-Bye” Bailey adapted well to the new formation as did Gambold who had a brief run with the Eagles. In ’51, Evy’s vision began to bear fruit as the Cougars jumped to a 7-3 record and battled number one ranked Cal to its limit before losing 42-35. They closed the year with a great 27-25 win over rival Washington. QB Bob Burkhart set a conference record fifteen TD passes thanks to end Ed Barker who caught forty-six passes for a record setting 864 yards. 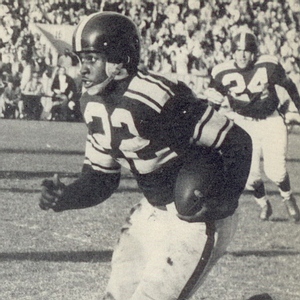 Barker spent a year each with Pittsburgh and Washington while Bailey went on to a brief NFL career with the Lions and Packers before starring in Canada for eleven seasons and entering their Hall Of Fame. Two way end Don Steinbrunner displayed real talent but guard Pete Rademacher could perhaps legitimately lay claim to being the toughest letterman of 1950 and ’51 as he was the 1956 Olympic boxing champion and fought Floyd Patterson for the World Championship in his first pro bout. Evy’s lengthy list of demands after the season, one that included the complete control over the football budget had him at odds with the administration thus it may have been easier to cite a desire to return to the Midwest and accept the head coaching position at Iowa for the 1952 season than lose his power play with the University Board and President. He quickly turned the Hawkeyes into a relevant program, taking them to their first Rose Bowl, winning two Rose Bowl contests, and putting them on the national scene. He retired from coaching at the young age of forty-two to become Iowa’s AD and ten years later, was fired from that position after constantly feuding with the coaches whom he had hired to lead the Hawkeyes. He left Washington State with a great deal more talent than he inherited two years before. Hampered by Evashevski’s parting comment that he had left Washington State “with a Rose Bowl team,” the Cougars’ new head coach Alton Kircher would be battling high expectations through the entire ’52 season. Evashevski’s main offensive assistant, “Al” Kircher had been a solid performer at Michigan State in football, baseball, and basketball. After coaching on the high school level he was an assistant coach for both sports at Michigan State and headed the basketball program before moving on to Washington State with Evy. There was immediate disappointment as the squad stumbled out of the gate with four consecutive losses and finished at 4-6. Burkhart again led as the Wing-T QB with Barker as a primary receiver. End and captain Steinbrunner stuck with the Browns through ’53 while FB Chuck Beckel had a hefty 6.4 yards per carry average. Harland Svare, drafted by the Rams played two seasons for them and then became an All Pro linebacker with the Giants, helping to lead their vaunted defense in their great seasons of the mid and late-‘60’s. He later was the head coach of the Rams and Chargers. Again 4-6 in 1953, Kircher would be fighting without the services of eleven graduating seniors. Bob Burkhart stood out as did FB Beckel who had rushing help from Pasco High School great, and the first African American to play in the State of Washington High School All Star Game, Talmadge “Duke” Washington. The flanks were solid with end Chuck England on one side and 6’8”, 230 pound PCC high jump record holder Howard McCants on the other. 1954 found the Cougars still using Evy’s version of the Wing-T, and they would post a 4-6 record for the third consecutive year. LB/RB Frank Sarno moved to QB, sharing the position with Bob Iverson and both looked to two-way end Arnie Pelluer. Beckel was again at FB. With four African American players on the roster, there had been no difficulties when the Cougars traveled to Waco, TX to play Baylor in 1952. However, the University Of Texas requested that team captain and starting FB “Duke” Washington remain home for their October 2nd game to avoid possible trouble. Washington became the first African American to play at Texas Memorial Stadium as the WSU administration ignored Texas’ request and he scored on a long run but the only “trouble” was due to the final 40-14 score that favored the Longhorns. Washington spent time in the Eagles’ camp and after two years in the military, one more season of pro ball with the BC Lions before becoming an art teacher. Expecting a successful season in ‘55 with almost all of his starters returning, Kircher watched an anemic offense that was shut out four times and scored one TD in two other games result in a 1-7-2 disaster despite good QB play by Bob Iverson and consistent running from HB Jim Hagerty who spent ’56 with the BC Lions. The 9-0 victory over rival Idaho was the sole win and even zero degree weather before the so-called “Refrigerator Bowl” game vs. San Jose State that should have favored the Cougars, resulted in a 13-all tie. At the end of the season, the final year of Kircher’s contract was bought out and the affable coach and his wife used the money to purchase and upgrade a motel and restaurant that became the premiere steakhouse in all of eastern Washington.